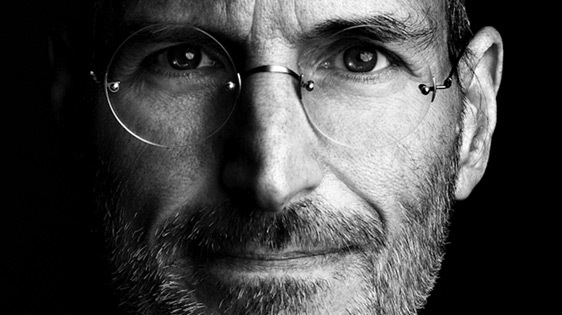 A colleague recently shared this article saying that Steve Jobs never listened to his customers. That, IMO, is a bit off. I am fairly sure it is not accurate to say that of Steve Jobs, but more importantly, I don’t think it is something that should inform how we do design ourselves. When you rely on consumer input, it is inevitable that they will tell you to do what other popular companies are doing. Exactly. Biz stakeholders do this, too. But nobody wants you to replicate exactly what someone else has done–what would be the point of that? The takeaway is just inspiration–there is something about these examples they are giving you that is inspiring to them. Maybe you can drill in on what they like about the existing solutions, or maybe you just take them as indicative and try to find the good in them yourself (or both!). A key point–valuable innovation does not come cheaply. It’s not a first-idea-out-of-your-head-is-right kind of thing. It’s not a process that prioritizes efficiency and cost management above discovering the best solution. This doesn’t mean good design is unattainable without a big budget and “world-class designers,” but it needs to be recognized that it doesn’t come free. It can’t really be tacked on as an afterthought, and the team and stakeholders at least needs to be invested in the goal of great design balanced with other concerns (usually cost and time). Of course. This is a truism in UX design; maybe it wasn’t a truism when Steve said it–I don’t know. Should you listen to customers is not a simple yes/no question. The question is when should you listen to customers, how should you listen to/ask them, and how should you incorporate what they tell you into your design process. Asking customers what they want can be valuable, especially when it comes to refinement. Once you release something, potentially something innovative, customers will (hopefully) begin to use it and tell you (if you are listening) things they like, don’t like, pain points, and aspirations. All of that is extremely valuable, and you are stupid and arrogant if you ignore it. But you don’t just make what people ask for. What they ask for is just an indicator of what they need, and sometimes it is a misleading indicator. For example, on Indigo Studio, we sometimes get asked “are you gonna do X?” where X is something they are used to doing with another tool. Sometimes X doesn’t fit at all with the design principles and goals of Indigo; in those cases, we’d have to have most of our customers demanding it before we’d do it, and even then, we would adapt it as best we can to the Indigo design language. More often, you can actually do X, but not quite in the way they are used to doing it, that is, you can meet the need but in a different way than they are used to. The important thing is that you don’t take what customers say at face value. You try to understand what the real need is and design for that in the context of what makes the best design given all of your constraints and goals. Focus groups are one of the least valuable ways to get feedback due to the group bias factor. Surveys can help, but they have to be crafted and analyzed well. One-on-one interviews are better, but you have to be careful not to lead people too much (and they are one of the more expensive methods). In-context observation usually yields design insights you wouldn’t get from a dialogue, and that’s also where a lot of potential innovation can come from. All of these are different ways you can listen to customers, and they can be applied effectively when they are appropriate. At the end of the day, though, you have these inputs, but they are just that–inputs, and you have to lean on designers to come up with creative solutions. You have to foster that creativity and provide room for it in your process and environments. Just thought I’d share my experience with a great product–the Nest Learning Thermostat. Given that I own an over 100-year-old house with radiator heating (and no central air), I was dubious about this working for me. After doing a fair amount of research, it came down to this one or the ecobee. The ecobee (main model) was more expensive and, frankly, just doesn’t look as good. Let’s face it; the Nest has been designed, by real designers, and it is obvious. Other thermostats on the market are clunky gear head boxes. I have noticed that things that appear to be well designed often are. Not only that, if people go through the trouble to do great industrial design, they usually at least try to do great software design, and maybe even full on service design, and in this, the Nest does not disappoint. 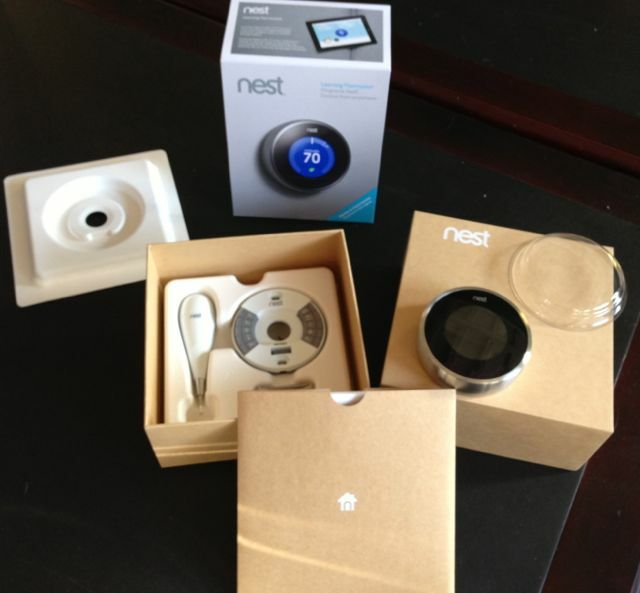 Everything from learning about the Nest ahead of time on their Web site to the out-of-the-box experience to the install to the setup to the ongoing usage (with apps for devices and a matching Web control site) has been designed, and designed well (and kudos to Amazon for 1-Click Prime ordering and one-day delivery–a day ahead of time).This is just one of those products where they have really pulled it off. And who’d have thunk it–for something as “simple” as a thermostat. I used their online compatibility checker to verify that it’d work with my system. I have one of those old-fashioned Honeywell round thermostats. But it turned out that after popping off the front, it was a relatively new model, the Honeywell CT87K, made for heat only systems. See the old wires?? Wrapped in like cloth or something. I told you it was an old house. 🙂 Anyways, zooming in I was able to see the R and W letters by the wires, so I could plug that into the compatibility checker, and voila, they said it was good, and they even give you a wiring diagram up front to show how you’ll hook it up. Pretty snazzy! You take off the plastic wrap, slit the tape holding it shut, slide off the cover, and open up. Lift out the Nest (has a little plastic circle on it), lift off the first layer, you see the booklet, lift that out, and you have the next layer of goodies. You see their chubby little screwdriver, the Nest back, and two mounting screws. Slide out the booklets; there are three. You have the install guide, the setup guide, and a “concierge” card (if you need to bail on a self install, a nice security blanket). What you see above is the first page, that tells you high level steps for uninstalling your old thermostat. What’s cool about it is the built-in stickers to label your current wires as you take them out. Given the variety of systems out there, and no standardization on colors, this is the only way to do it. So be careful! For me, of course, it was simple–two wires. But I labeled them anyway! BEFORE MOVING ON, CUT THE POWER TO YOUR THERMOSTAT. For me, the thermostat wires come from the boiler, so the circuit to break was the boiler’s circuit. I verified this using my handy dandy Greenlee GT-16 Adjustable Non-Contact Voltage Detector, which I bought some time ago for other amateur electrician work on this old house. I can detect voltage in the air on the max sensitivity, so what I usually do is check it before trying to disconnect. Dial it back until it detects only when you’re near the hot wire. BTW, don’t take my word for it–I am not an electrician; YMMV. Now that you’ve cut power, you can label the wires safely. Even though the old plugs only say R and W, Rh and W1 were the only/closest option, and it matched the wiring diagram from the compat checker. Now, niftily enough, the screwdriver they include has a small enough head on it to reach in those holes on the right and unscrew (loosen) the wire clamps. Simply pull them out at that point. I cheated and used my drill to quickly remove the two screws holding it onto the wall. I carefully pulled it off the wall at that point, to avoid ripping any extra paint off (the painters got mighty close to it). It revealed the green wall beneath the new cream paint. Here’s the whole old thermostat. It probably took you more time to read this than it did to get the old one off. Now for the install. I walked the Nest’s back over and looked at where it would install. The hole is in the center on the Nest; on the old one you can see it was to the left. Bottom line, this meant I couldn’t cover up the old green with just the nest, and since I didn’t have any putty or paint handy, it was back to the Nest box for the decorative backing plate. Lift up the last layer in the box to reveal the backing choices; they have an option to mount on electrical boxes as well. I just needed the pretty plate to cover the ugly wall stuff. Again, I cheated with my cordless drill (Makita 18V Lithium Ion, BTW, if you need a recommendation). Would be more annoying (not impossible) to use their included screwdriver. Now, I used my old, somewhat crappy level to install this. It didn’t quite come out straight, as you can see. Then I noticed the built-in level, and also, the screw holes have a little play, so I loosened the bottom one and realigned using their level. Hey, look, it also aligned with the nearby wall edge at that point, too! Oh yeah, I plugged in the two wires into the matching slots. One of the cooler but maybe non-obvious features of Nest is that it runs fine on your 24VAC line. Many new/digital thermostats require a “common” lead that provides dedicated power. Not so with Nest–no extra wiring needed. Even my ancient two-wire system works fine with it! Just use their compat checker to verify yours. My wires are tough (they were made back when men were men, wires were wires, and little furry creatures from Alpha Centauri were little furry creatures from Alpha Centauri); they are not huge but not thin either, so I used needle nose pliers to straighten them. A more obsessive person may have grabbed some electrical tape to cover up more of the exposed wire. Me? I don’t sweat the small stuff. It will soon be covered up. We’re almost there! Next step, grab the pretty Nest and plug it on. NOW, you can go flip the switch back on. My breaker box is in the basement, but no worries, when I came back up, it was waiting for me. Time to setup. You say “Hi” to it, and confirm your language, then on to the coolest part of the gadget–it is Wifi connected. Seems to have a decent antenna, too. I also thought the interface for entering the password is cool. The Nest slides so smoothly. Feels solid, and dialing it to enter the password was strangely reminiscent of using a rotary phone. (Yes, I remember using them, although they were definitely on their way out by that time.) Hello, nostalgia. And it wasn’t that hard either. They seem to have put thought into how fast you turn, inertia, and that sort of thing. Nice. After a short connecting message, it confirms, we have lift off! BTW, I glanced through the setup manual. It is super thin and easy to follow. You don’t really need it though at this point–just follow the prompts. After confirming I only have heating installed, it just needs to ask a few questions about it. A few more questions–zip code and number of thermostats. Now I get to my favorite question. When was this house built? What? No 1910s? Come on! Next up, naming this Nest; wish I could do a custom name, but they just have some preset to pick from. Ah well. Can’t have everything! Last, it asks a couple simple questions about temps and lets you know it’ll try to learn/calibrate for some time. And.. we’re done! As before, it likely took you longer to read my account than it will to set your Nest up in real time. In fact, I bet Nest is annoyed with me because this may make it seem more complicated than it is. 🙂 Really, we’re talking <30 min end to end, and it felt great and easy! At this point, I was pretty pumped, because I wanted to go control it from my phone. But first, to the Web site. I quickly signed up, and it detected the nest on the network. Too cool! I walked over to it again, and it said this. Too cool! In no time, I was managing my thermostat remotely. THE POWER!!! And the app is nifty. It seems to gradually reveal complexity (another great UX principle). Just tonight I discovered some new things that weren’t there before. Still, it is quite simple and pleasing. I like how it incorporates local conditions in the background. For instance, now it’s like so. I won’t bore you (more) with all the settings and stuff. The interface is quite nice and, in my estimation, easy to learn and use. And hey! Will you look at that!? I guess you can have everything–it let me rename my thermostat here. I am a little obsessive. Sometimes. About some things. I try to fight it, but it gets me sometimes. I quickly set up a schedule (even though it wants to learn it by you turning it up and down). I mean, I don’t want to run downstairs in the morning to turn the heat up–I want it done for me! This is a minor criticism, but I guess it works for “most” people who wouldn’t otherwise set up the schedule. In the Web interface, this is easy enough. Add a setting, then copy and paste it to the other days. OMG. Like, I programmed the three thermostats at my last place, and what a friggin pain! No wonder they say 90% of people don’t do it. I dreaded changing the temps, too, cuz it meant clicking and switching through about 100 fiddly switches. This took me 30 sec. Wow. And yesterday, I discovered my new favorite feature–the energy records. I can see my obsession will not soon end. You can selectively drill into daily details to see just when Nest was powering on that monster of a furnace against your schedule for the day. I think I’m in geek-homeowner love! Now, time will tell if this does help me save money. I can’t see how it won’t. I mean, last winter (our first in this old house), I just left it on a constant 66-7ish setting on the dial, more or less. If nothing else, being able to have it turn down during the evenings should save a good chunk of change. And considering how much this old house costs me per month to heat, trust me, in like two months it will probably pay for itself. So that brings us to the final consideration. Is the Nest worth $250? Well, from the research I did, learning thermostats can save 10-15% on average. You can do the math based on your usage. But that’s just part of the story. This is one grand toy, after all, no? 🙂 So a great toy that can save you money? Is it worth it? I think so. P.S. Nest didn’t pay me for this review. I’m just totally psyched about it. It took probably 6x the time to put together than installing it took. (Don’t worry–I was watching Burn Notice in the background with the wifey for most of it.) But if you use my links to buy, I might get some small Amazon affiliate commission. So that’d be a nice thing if you found this helpful. This last Friday I had the honor of presenting the keynote for the Tulsa TechFest 2012. Very well-organized event considering its size–good job to all the organizers and volunteers! My talk was a talkified version of my recent “UX for Devs Manifesto” blog I wrote earlier this year. It was nice to get it out and share the ideas in person. It seemed to be well received. Anyways, I said I’d post the slides and a few related resources, so here ya go. Did I forget something? Let me know! Also, check out my UX Book List for some recommended books. I don’t seem to have good luck with Verizon’s self-service. Back in April this year, I started getting notified that my contract (for Fios) was expiring, inviting me to come online and look at options. I followed this, and here’s what I saw. The URL in the browser is https://www22.verizon.com/FORYOURHOME/GOFLOW/Common/LocalBusinessOfficeSR.aspx?Message=BTNNQ-CSR. Now, having been a Web developer for some years, I tried all the normal stuff that I could do on the client–different browsers, clearing cookies, restarting–all to no avail. It is pretty clearly a server-side error. After this, I reached out to the (apparently) only capable folks on frontline Verizon Support, @VerizonSupport. They’ve gotten me out of jams a couple times, when dealing with the regular support folks doesn’t help. And they effectively did help, even if it took a few days. They got the case to the dev team quickly, and it was resolved in a reasonable amount of time. Great! Problem solved!? Well, temporarily, it seems. The other day I saw the ad for “Quantum,” which is the new insanely speedtacular options for Fios. So I thought I’ll go check those out, and I had deja vu–the same process, same error above. I reached out to @VerizonSupport (via DM–we’re old pals now), and they’re looking into it. Will update this post with the result of that (actually I’m posting in part to help them–so they can see the error exactly and pass it on).. Resolved! 14 Aug 2012: Yesterday I could successfully log in and look at my options. That did not, in my case, solve it for me, as the online tool wouldn’t let me switch to a no-TV option, but hey, the bug was fixed in short order! Anyhow, I said thanks and that I’d think about the options. I called back later (this was Saturday), and I talked to a nice fella who was eager to help me change from a TV+Internet bundle to a, get this, more expensive internet only bundle. Can you guess what he said to me? What? You mean to tell me that I’m offering to extend my 2-year contract to a more expensive internet only option, and you want to charge me an “early termination” fee? Resolved! 14 Aug 2012: The supervisor who supposedly was going to call me back didn’t, so I called in again yesterday. The rep I spoke to there had me straightened out in less than 10 minutes. No early termination fee; the plan I asked for. Easy as pie. When people get errors is the time when they’re most frustrated, and so you want to handle that very carefully and smoothly–make getting a resolution as fluid and easy as possible. Don’t just punt and say “call us!” Especially for folks who are already online–the context is there, just connect the dots for them. This could have been an opportunity for Verizon to wow me (and others who are undoubtedly running into it) with how smoothly they deal with failure. Instead, I get passed around, asking me to do extra work and effort to resolve it. Not good. And the fact that I get significantly different levels of quality of service from their email support to their Twitter support can’t be good. Twitter is not great for resolving issues–limiting to 140 chars is just not ideal. I can only imagine it’s not ideal for their CS systems to track, either. But if we customers are taught we get better service that way, well, guess who we’ll go to when I need help? As for the sales thing, I expect them to skip the fee; it’s just a tad wonky that it came up in the first place. I’m sure there’s a perfectly good “reason” why “the system” is acting the way it is. But the bottom line is that it’s broken. It’s not as if I’m asking to leave Verizon for another dealer. I just want to change the shape of the bits that are flowing in and out of my house. Overall, I’d have to give a C in my quality of experience. The Twitter support is a redeeming factor–that team gets an A, especially given how they work around Twitter’s inherent limitations. Keep working on it, Verizon.